Use a quick spray of your favorite oil (I use avocado for this recipe) in a good, non-stick pan over medium heat. Break egg whites only* and whip them into a lather. Pour into heated pan and add salt and pepper to taste. *Because this is a very low fat dish, allowing egg yolk (whole or partial) is excellent for additional nutrition and flavor! It also helps the eggs hold together nicely. Warm the beans and a splash of salsa on the stovetop on medium-low. Once the eggs have set, slip them to cook on the other side. When done to your liking, slide onto a plate and top with warm beans and fold in half. 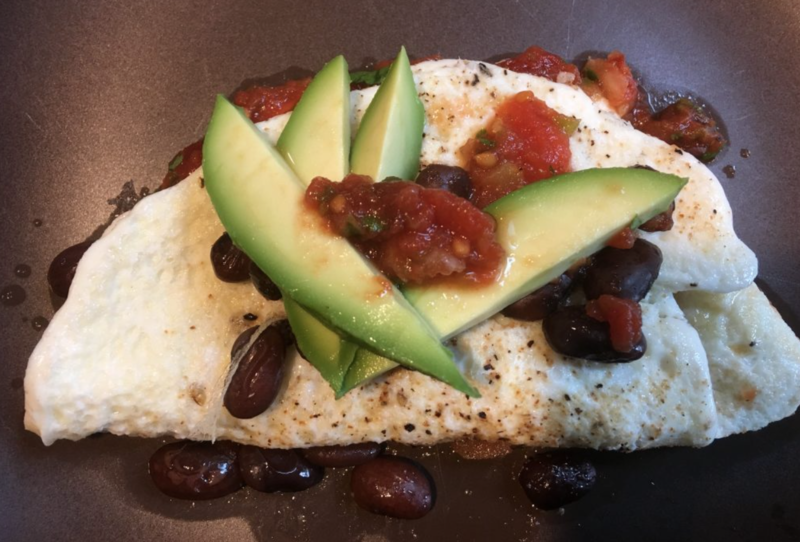 Top with avocado slices and more salsa and enjoy!